Simon Lehna Singh, MBE (born 19 September 1964) is a British popular science author, theoretical and particle physicist whose works largely contain a strong mathematical element. His written works include Fermat's Last Theorem (in the United States titled Fermat's Enigma: The Epic Quest to Solve the World's Greatest Mathematical Problem), The Code Book (about cryptography and its history), Big Bang (about the Big Bang theory and the origins of the universe), Trick or Treatment? Alternative Medicine on Trial (about complementary and alternative medicine, co-written by Edzard Ernst) and The Simpsons and Their Mathematical Secrets (about mathematical ideas and theorems hidden in episodes of The Simpsons and Futurama). In 2012 Singh founded the Good Thinking Society. Singh has also produced documentaries and works for television to accompany his books, is a trustee of NESTA and the National Museum of Science and Industry, a patron of Humanists UK, founder of the Good Thinking Society, and co-founder of the Undergraduate Ambassadors Scheme. Singh's parents emigrated from Punjab, India to Britain in 1950. He is the youngest of three brothers, his eldest brother being Tom Singh, the founder of the UK New Look chain of stores. Singh grew up in Wellington, Somerset, attending Wellington School, and went on to Imperial College London, where he studied physics. He was active in the student union, becoming President of the Royal College of Science Union. Later he completed a PhD in particle physics at the University of Cambridge as a postgraduate student of Emmanuel College, Cambridge while working at CERN, Geneva. In 1983, he was part of the UA2 experiment in CERN. In 1987, Singh taught science at The Doon School, the independent all-boys' boarding school in India. In 1990 Singh returned to England and joined the BBC's Science and Features Department, where he was a producer and director working on programmes such as Tomorrow's World and Horizon. Singh was introduced to Richard Wiseman through their collaboration on Tomorrow's World. At Wiseman's suggestion, Singh directed a segment about politicians lying in different mediums, and getting the public's opinion on whether the person was lying or not. My writing initially was about pure science but a lot of my research now has been inspired by his desire to debunk things such as the paranormal – we both hate psychics, mediums, pseudoscience in general. Singh directed his BAFTA award-winning documentary about the world's most notorious mathematical problem entitled "Fermat's Last Theorem" in 1996. The film was memorable for its opening shot of a middle-aged mathematician, Andrew Wiles, holding back tears as he recalled the moment when he finally realised how to resolve the fundamental error in his proof of Fermat's Last Theorem. The documentary was originally transmitted in October 1997 as an edition of the BBC Horizon series. It was also aired in America as part of the NOVA series. The Proof, as it was re-titled, was nominated for an Emmy Award. The story of this celebrated mathematical problem was also the subject of Singh's first book, Fermat's last theorem. In 1997, he began working on his second book, The Code Book, a history of codes and codebreaking. As well as explaining the science of codes and describing the impact of cryptography on history, the book also contends that cryptography is more important today than ever before. The Code Book has resulted in a return to television for him. He presented The Science of Secrecy, a five-part series for Channel 4. The stories in the series range from the cipher that sealed the fate of Mary, Queen of Scots, to the coded Zimmermann Telegram that changed the course of the First World War. Other programmes discuss how two great 19th century geniuses raced to decipher Egyptian hieroglyphs and how modern encryption can guarantee privacy on the Internet. When I finished my PhD, I knew I wasn't exceptionally good and would never get the Nobel prize. As a kid, I wanted to be a footballer then a commentator. If I couldn't be a physicist, I'd write about it. In October 2004, Singh published a book entitled Big Bang, which tells the history of the universe. It is told in his trademark style, by following the remarkable stories of the people who put the pieces together. In 2003, Singh was made a Member of the Order of the British Empire (MBE) for services to science, technology and engineering in education and science communication. In the same year he was made Doctor of Letters (honoris causa) by Loughborough University, and in 2005 was given an honorary degree in Mathematics by the University of Southampton.He continues to be involved in television and radio programmes, including A Further Five Numbers (BBC Radio 4, 2005). He made headlines in 2005 when he criticised the Katie Melua song "Nine Million Bicycles" for inaccurate lyrics referring to the size of the observable universe. Singh proposed corrected lyrics, though he used the value of 13.7 billion light years; accounting for expansion of the universe, the comoving distance to the edge of the observable universe is 46.5 billion light years. BBC Radio 4's Today programme brought Melua and Singh together in a radio studio where Melua recorded a tongue-in-cheek version of the song that had been written by Singh. In 2006, he was awarded an honorary Doctor of Design degree by the University of the West of England "in recognition of Simon Singh's outstanding contribution to the public understanding of science, in particular in the promotion of science, engineering and mathematics in schools and in the building of links between universities and schools". This was followed up by his receipt of the Kelvin Medal from the Institute of Physics in 2008, for his achievements in promoting Physics to the general public. In July 2008, he was also awarded a degree of Doctor of Science (Honoris Causa) by Royal Holloway, University of London. In July 2011, he was awarded another degree of Doctor of Science (Honoris Causa) by the University of Kent for services to Science. In June 2012, Singh was awarded the Honorary Degree of Doctor of Science (honoris causa) for his contribution to science communication, education and academic freedom by The University of St Andrews. Singh was part of an investigation about Homeopathy in 2006. This investigation was made by the organization Sense About Science. In the investigation, a student asked ten homeopaths for an alternative to her preventative malaria medication. All ten homeopaths recommended homeopathy as a substitute. This investigation was reported by the BBC. Simon is a member of the Advisory Council for the Campaign for Science and Engineering. He is the inaugural recipient of the Lilavati Award. In February 2011 he was elected as a Fellow of the Committee for Skeptical Inquiry. When the case was brought against him, The Guardian supported him and funded his legal advice, as well as offering to pay the BCA's legal costs in an out-of-court settlement if Singh chose to settle. A "furious backlash" to the lawsuit resulted in the filing of formal complaints of false advertising against more than 500 individual chiropractors within one 24-hour period, with one national chiropractic organisation ordering its members to take down their websites, and Nature Medicine noting that the case had gathered wide support for Singh, as well as prompting calls for the reform of English libel laws. 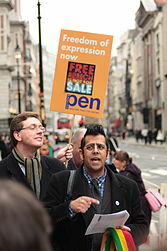 On 1 April 2010, Simon Singh won his court appeal for the right to rely on the defence of fair comment. On 15 April 2010, the BCA officially withdrew its lawsuit, ending the case. 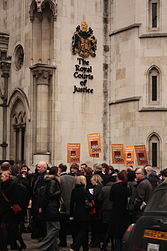 To defend himself for the libel suit, Singh's out-of-pocket legal costs were tens of thousands of pounds, but the trial has acted as a catalyst and focus for libel reform campaigners resulting in all major parties in the 2010 general election making manifesto commitments to libel reform. On 25 April 2013 the Defamation Act 2013 received Queen Elizabeth II’s Royal Assent and became law. The purpose of the reformed law of defamation is to 'ensure that a fair balance is struck between the right to freedom of expression and the protection of reputation'. Under the new law, claimants must show that they suffer serious harm before the court will accept the case. Additional protection for website operators, defence of 'responsible publication on matters of public interest' and new statutory defences of truth and honest opinion are also part of the key areas of the new law. Singh married journalist and broadcaster Anita Anand in 2007. The couple have two sons and live in south-west London. ^ a b Singh, Simon (2011). "How English libel law has a global chill on free speech". Cortex. 47 (6): 643–644. doi:10.1016/j.cortex.2011.03.007. PMID 21458790. ^ "Simon Singh: "The Simpsons and Their Mathematical Secrets" - Talks at Google". YouTube. 4 December 2013. ^ "Book awards: Science Writing Award". Library Thing. Retrieved 7 April 2018. ^ "Simon Singh wins Maiden Leelavati Award" (PDF). Math Union. Retrieved 10 February 2018. 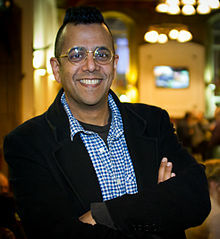 ^ "Author Simon Singh Will Receive First-Ever Lilavati Award at ICM 2010". Mathematical Association of America. Retrieved 10 February 2018. ^ Singh, Simon (1997). Fermat's Last Theorem. Fourth Estate. ISBN 1-85702-669-1. ^ Singh, Simon (1998). Fermat's Enigma: The Epic Quest to Solve the World's Greatest Mathematical Problem. Anchor. ISBN 0-385-49362-2. ^ Singh, Simon (2000). The Code Book: The Science of Secrecy from Ancient Egypt to Quantum Cryptography. Anchor. ISBN 0-385-49532-3. ^ Singh, Simon (2005). Big Bang: The Origin of the Universe. Fourth Estate. ISBN 0-00-716220-0. ^ Singh, Simon; Ernst, Edzard (2008). Trick or Treatment? Alternative Medicine on Trial. Transworld. ISBN 978-0-593-06129-9. ^ Singh, Simon (2013). The Simpsons and Their Mathematical Secrets. Bloomsbury Publishing. ISBN 9781620402771. ^ Simon Singh. "About". GTS website. Good Thinking Society. Retrieved 29 May 2015. ^ "The Simon Singh Interview". Imperial College London. October 1999. Retrieved 29 November 2009. ^ Singh, Simon Lehna (1991). Heavy flavour physics at the CERN PP̄ collider. lib.cam.ac.uk (PhD thesis). University of Cambridge. OCLC 59965980. EThOS uk.bl.ethos.385498. ^ a b "Meet Simon Singh". 20 July 2013. Retrieved 15 January 2014. ^ "Richard Wiseman and Simon Singh: How we met". The Independent. 28 September 2014. Retrieved 7 December 2014. ^ "No. 56963". The London Gazette (Supplement). 14 June 2003. p. 22. ^ Singh, Simon (30 September 2005). "Katie Melua's bad science". London: The Guardian. Retrieved 12 December 2008. ^ Lineweaver, Charles; Davis, Tamara M. (2005). "Misconceptions about the Big Bang". Scientific American. Retrieved 6 November 2008. ^ "Listen Again". Today Programme. BBC Radio 4. 15 October 2005. Retrieved 18 May 2008. ^ "UWE awards honorary degree to Dr Simon Singh MBE". News 2006. University of the West of England. 28 November 2006. Retrieved 12 December 2008. ^ "The Kelvin Medal and Prize: 2008 Medallist". Subject Awards. Institute of Physics. Retrieved 12 December 2008. ^ "2008 Honorary Graduates and Fellows become part of a prestigious network". Media & Events. Royal Holloway, University of London. Retrieved 12 December 2008. ^ Tobin, Alyson (22 June 2012). "Laureation Address – Dr Simon Singh". University of St Andrews. Retrieved 1 June 2013. ^ "Malaria and homeopathy". Retrieved 15 January 2014. ^ Fraser Cain (24 October 2006). "Dodgy Homeopathy" (Podcast). Skeptic. Event occurs at 8:50. Retrieved 29 July 2014. ^ "Malaria advice 'risks lives'". BBC News. 13 July 2006. Retrieved 15 January 2014. ^ "Advisory Council of the Campaign for Science and Engineering". Retrieved 11 February 2011. ^ "Simon Singh wins maiden Leelavati Award" (PDF). ICM 2010 webpage. 27 September 2010. ^ "CSI announces new Fellows". Retrieved 7 August 2011. ^ Eden, R (16 August 2008). "Doctors take Simon Singh to court". The Daily Telegraph. Retrieved 12 December 2008. ^ Boseley, Sarah (14 May 2009). "Science writer accused of libel may take fight to European court". London: The Guardian (UK). Retrieved 19 May 2009. ^ Lucas Laursen. "The Great Beyond: Chiropractic group advises members to 'withdraw from the battleground'". Nature.com. Retrieved 20 June 2009. ^ "The Skeptic Zone episode 273". 13 January 2014. Retrieved 15 January 2014. ^ Willyard, C. (2009). "Lawsuit sparks calls for libel law reform". Nature Medicine. 15 (723): 723. doi:10.1038/nm0709-723b. ^ "Simon Singh wins libel court battle". London: Guardian. 1 April 2010. Retrieved 1 April 2010. ^ "British Chiropractic Association v Singh — BCA admits defeat". Ely Place. Retrieved 15 April 2010. ^ British Parliament (25 April 2013). "Defamation Act 2013". ^ Levin, Angela (7 August 2012). "My perfect weekend: Anita Anand, radio and TV presenter". The Daily Telegraph. Retrieved 16 December 2018. 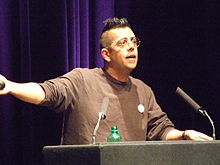 Wikimedia Commons has media related to Simon Singh.